National Mouse Club Standard - Satin: The Satin mouse shall have a high sheen coat resulting in exquisite satin- like or metallic gloss. The colour may be that of any standardised variety and should be as close as is possible to that variety, having due regard to the effect of satinisation. White to be known as Ivory Satin and should be as white as possible. National Mouse Club Standard - Tan: Tans are recognised in any standard colour and the top colour shall be as laid down for these varieties. The Tan belly shall be a rich golden hue, as rich as possible and there should be a clear line of demarcation between top colour and tan, running in a straight line along the flanks, chest and jaws. There should be no brindling or guard hairs. Eye colour shall be as in the non tan varieties. Colour of feet should be inside tan and remainder of foot same as top colour. Wholly tan feet considered a greater fault than feet all same colour as top. National Mouse Club Standard - Champagne: Eye Pink. The colour should be that of champagne silk with a pinkish tinge, free from mealiness and well carried out under. National Mouse Club Standard - PEW (Ivory): Eye pink. The white shall be pure in colour. National Mouse Club Standard - Silver: Eye pink or black. This is a delicate shade, as near as possible to an old silver coin (not the present cupro-nickel). It should be sufficiently solid to leave no doubt of it being a self. - - - - - - - - - - - - - - - - - - - - - - - - Rosewood previously bred Abyssinian in Ivory Tan, Silver Tan (Satin) & Champagne Tan (Satin). I took on Abyssinians from Sarah Yeomans of Blackthorn stud, to help continue the varieties' improvement and bring it up to show standard. They were being going to be bred to Ivories at certain generations, to improve size & tail/ear sets. National Mouse Club Standard - Agouti: Eye Black. The Agouti shall be a rich brown or golden hue with even dark or black ticking all through. Undercolour black. The belly shall be a golden brown, ticked as on top and the feet shall match the body in colour and ticking. - - - - - - - - - - - - - - - - - - - - - - - - Rosewood previously bred Agouti, but the odd Tan came out in litters. National Mouse Club Standard: Eye as in other standardised colours. A mouse of any recognised standard colour, with a white zone encircling the body and to occupy one quarter of the length of the body positioned at the third quarter of the body length from the head, excluding the tail; sharpness of demarcation to be of prime importance. Feet white. - - - - - - - - - - - - - - - - - - - - - - - - Rosewood previously bred Banded in a variety of colours, against PEW, to help improve variety and bring it up to show standard. However, the majority of our banded were elderly, so therefore never bred. We are on the look out for more. National Mouse Club Standard: Eye colour to be as in standardised variety. A Broken marked should be as far removed from the Even or Dutch marked mouse as possible; that is to say it should not have either Dutch cheeks, saddle or any markings which may be considered evenly placed. The spots or patches should be well distributed all over the body and head, the more uniform in size, the better, also the greater in number and they should be free from brindling. There must be a spot or patch on one side of the nose. A Broken marked mouse without a nose spot must be disqualified. The nose spot defined as a spot on one side only of the nose, including the whisker bed. - - - - - - - - - - - - - - - - - - - - - - - - Rosewood previously bred Broken Marked in Black and Agouti. National Mouse Club Standard: Eye colour to be as in standardised variety. In Dutch marked the face or cheek markings should be evenly balanced, a patch covering each side of the face, extending below the eye but not including the whiskers, and not joining between the ears at the narrowest part of the blaze. The cheek markings should not run underneath the jaw. The saddle should come well up from the tail to the middle of the body and be clean cut, top and under. Tail stop to be approximately halfway along the tail. The stops on the hind feet should come halfway between the tips of the toes and the hock. Colour of markings should be carried out in the ears. The coloured markings may be any standard colour. - - - - - - - - - - - - - - - - - - - - - - - - Rosewood previously bred Dutch in Black, though our mice carried Chocolate, Blue and Dove. National Mouse Club Standard: Eyes any colour. Body colour medium beige. Shadings: Gradually shaded over saddle and hind quarters, merging gradually with body colour and being darkest at tail root as seen in the Siamese cat. The belly should be as near as possible in colour and shadings. Points: Seal coloured points shall be present in muzzle, ears, feet, tail and tail root. There should not be a definite or distinct line of demarcation but rather a harmonious balance between body colour, shadings and points. There should not be any blotches, streaks or white hairs. - - - - - - - - - - - - - - - - - - - - - - - - Rosewood previously bred Siamese to improve number and breed to Splashed. Siamese may return to the stud. National Mouse Club Standard: Eye Black. A Silver Fox shall be recognised in black, blue, chocolate and lilac top colour. Feet sides and rump only to be ticked evenly with white hairs. Belly white. - - - - - - - - - - - - - - - - - - - - - - - - Rosewood previously bred Silver Fox in Black & Chocolate. National Mouse Club Standard: Splashed are currently an un-standardized variety. They usually have pink eyes and are currently being used by the club to the elusive tricolours. 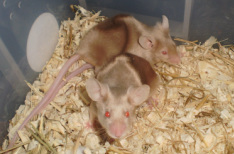 Splashed are quite similar to Variegated mice but are unique in their own way. There has been talk of attempting to get them standardized, I hope the club manages it. - - - - - - - - - - - - - - - - - - - - - - - - Rosewood previously bred Splashed against Siamese, to create Tricolour. Splashed will return to the stud. National Mouse Club Standard: Eye pink or black. The white shall be pure in colour. - - - - - - - - - - - - - - - - - - - - - - - - Rosewood previously bred PEW to Abyssinian and Variegated, to improve size and tail/ear sets.